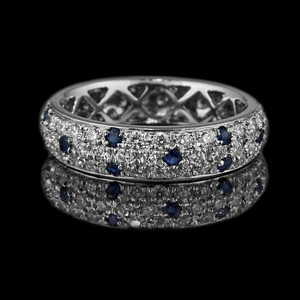 Tanzanite & Diamond Engagement Ring 1.09ct Oval Tanzanite set with 0.50ct diamond cluster engagement ring recently finished for a Rumour Jewellery customer and photographed for the Rumour portfolio and website. 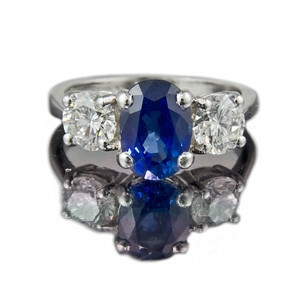 Simple conservative design with the twist of the modern Tanzanite. As you might know these stones are only found in Tanzania and will one day have run out! 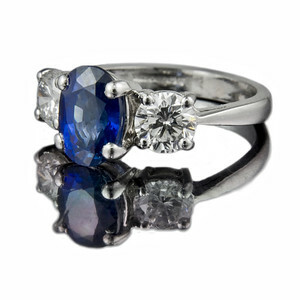 Cushion Cut Ceylon Sapphire Engagement Ring Four claw set cushion cut sapphire with a pair of 0.50ct brilliant cut diamond side stones in matching settings. Set in platinum. 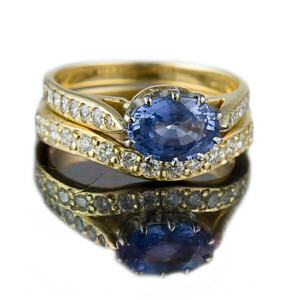 Similar to one of our other cushion cut sapphire designs, but, as ever, subtely different. This ring just came back for a tune-up and clean. Aquamarine and diamond ring in 18ct yellow gold 4.65ct oval aquamarine with six 0.10ct brilliant cut diamonds set in 18ct yellow gold. Photographed for the website and portfolio. 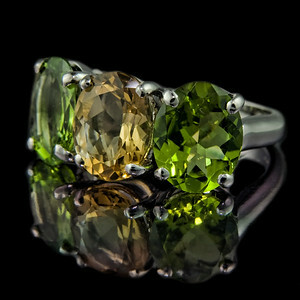 Green sapphire and diamond ring E colour VVs1 0.50ct brilliant cut diamond with two green sapphires set in platinum. Our use of the scalloped rub-over settings for the side stones works very well to create a smoother look to the overall design. 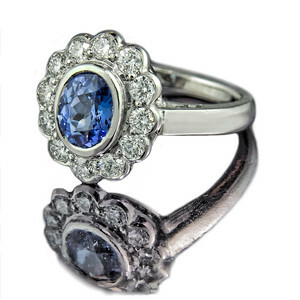 A simple ring with unusual side stones makes this design a truly unique ring. Photographed for our portfolio at Rumour Bespoke Jewellery. 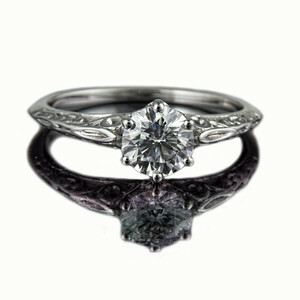 Diamond Engagement Ring "Victoriana" 0.71ct D coloured VS1 (excellent cut) brilliant cut diamond ring in a Victorian style carved platinum setting designed for a client at Rumour Jewellery and photographed for Rumour's bespoke jewellery portfolio and website. 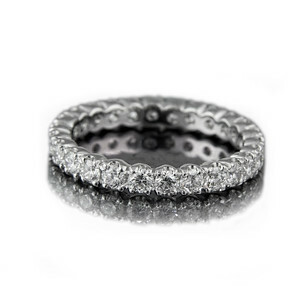 Diamond set wedding ring Brilliant cut diamonds all the way around this wedding ring designed to fit with one of our engagement rings at Rumour. 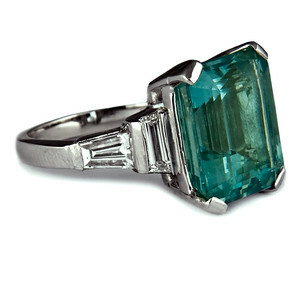 Emerald cut aquamarine 4ct emerald cut aquamarine with tapered diamonds set in 18ct white gold. 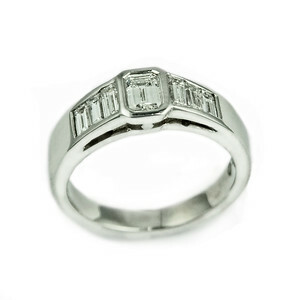 A timeless design for art deco style. Photographed for the Rumour Jewellery portfolio. 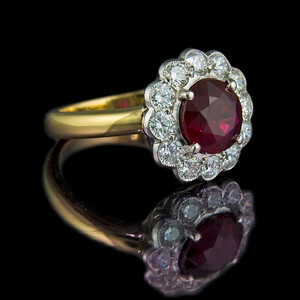 A ring we made a while ago that came in for a service and stone re-condition. 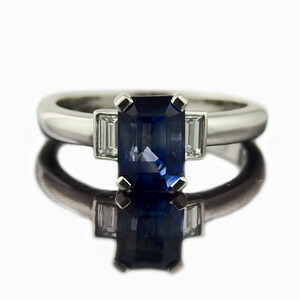 "Empire" Art Deco Sapphire engagement ring Art Deco for the 21st century. 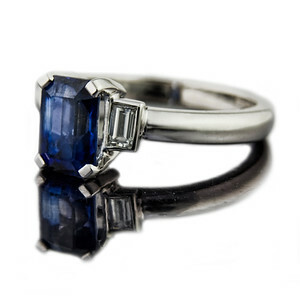 A specially cut 1.85ct sapphire and 0.60cts diamond ring set in 18ct white gold This ring was designed to match the glamour of the Art Deco era that it was inspired by, but with state-of-the-art computer aided design to make sure the stones were cut exactly. Photographed for Rumour Jewellery website and portfolio. 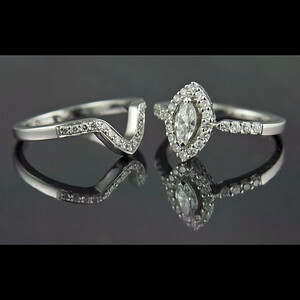 Marquise diamond ring with V shaped diamond wedding ring A V shaped diamond wedding ring to go with the marquise diamond engagement ring. I photographed these for the Rumour website and portfolio. 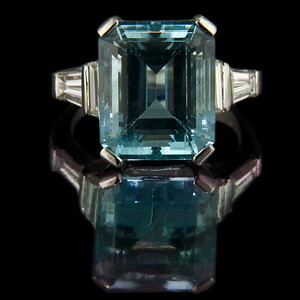 Emerald cut sapphire engagement ring Art-Deco style emerald cut sapphire with step-down baguette diamonds. Well people are saying its like we are living in the 1930's! 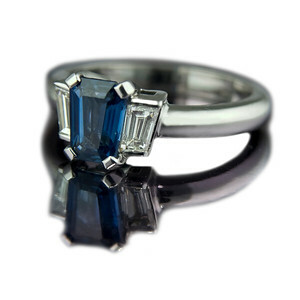 2.55ct emerald cut blue sapphire set in 18ct white gold. The step-down baguette diamonds are 0.16cts each. 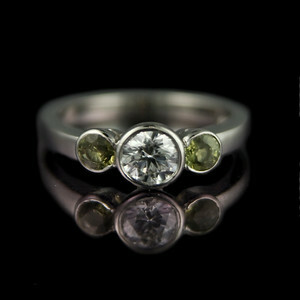 I photographed this engagement ring for the website portfolio. 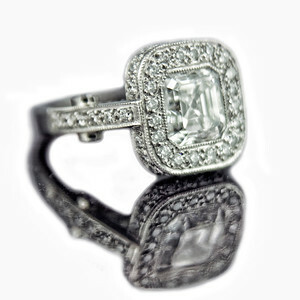 Asscher cut diamond engagement ring 2008A new version of an old favourite. The bespoke Asscher cut diamond engagement ring remains one of our most popular designs... and most expensive, so we don't make them very often! 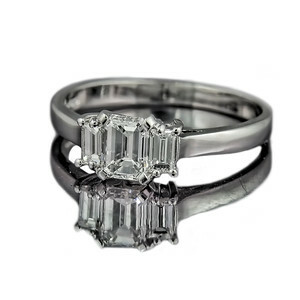 2.01ct Asscher cut G colour, VS2 clarity, excellent cut, excellent polish.... you get the general idea! Photographed for our portfolio. 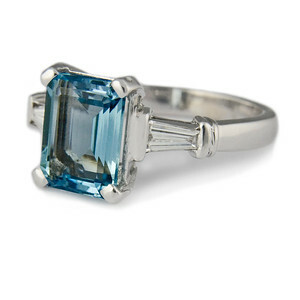 Emerald cut aquamarine engagement ring 8.2ct emerald cut aquamarine with trapezoid cut and tapered diamond step-down shoulders set in platinum.. 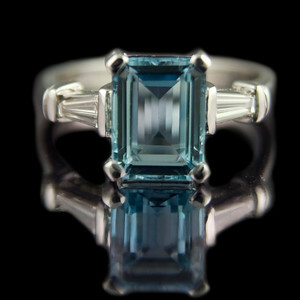 The ultimate aquamarine ring. 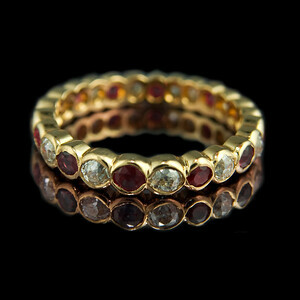 Spin three "Spin Three" Eternity ring A round sapphire with two brilliant cut diamonds and alternate gold beads set in 18ct yellow gold. Photographed for the website and portfolio. 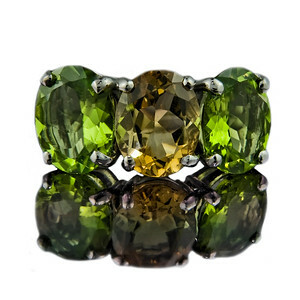 This is a variation on the Spin Six ring we made last year. My new photographic technique with a reflection on white seems to be working ok for this image. 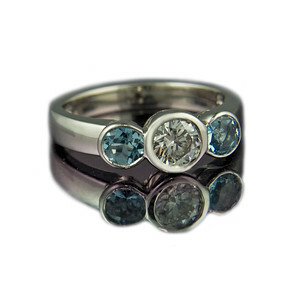 Brilliant-trillian diamond ring One of our old favourites... Brilliant cut diamond engagement ring with trillian side stones in a platinum setting.. A classic Rumour ring design with beautiful complimentary shapes and symmetry. 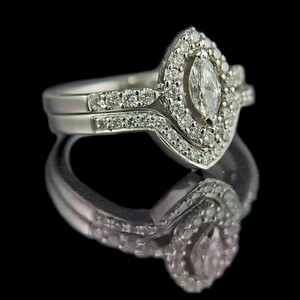 Diamond engagement ring "Galleon" "More bling please!" Said the client, about the ring I designed for her back in March. 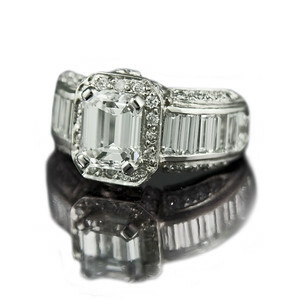 "Certainly Madam... this we can always arrange" 2.01ct E colour, VS1 emerald cut diamond. 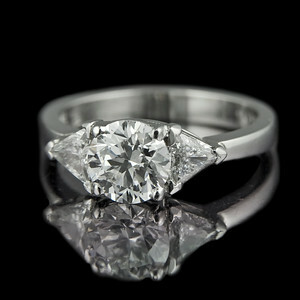 Approximately 20 x 1 point brilliant cut diamonds pave set around the central stone. 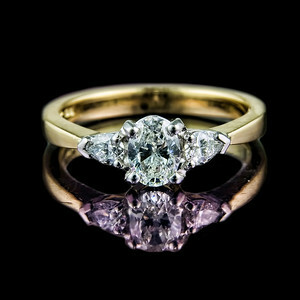 Four corners and centre of gallery diamond set with 8 x 0.10ct stones, and two x 0.20ct stones. 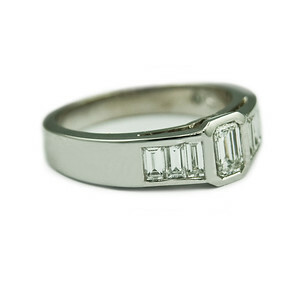 The ring shank is set with 5 pairs of graduated baguettes (1.10cts), a pair of trapezoids (0.41ct) and approximately 0.40ct 1 point brilliant cut diamonds set around in the shank. Set in platinum. 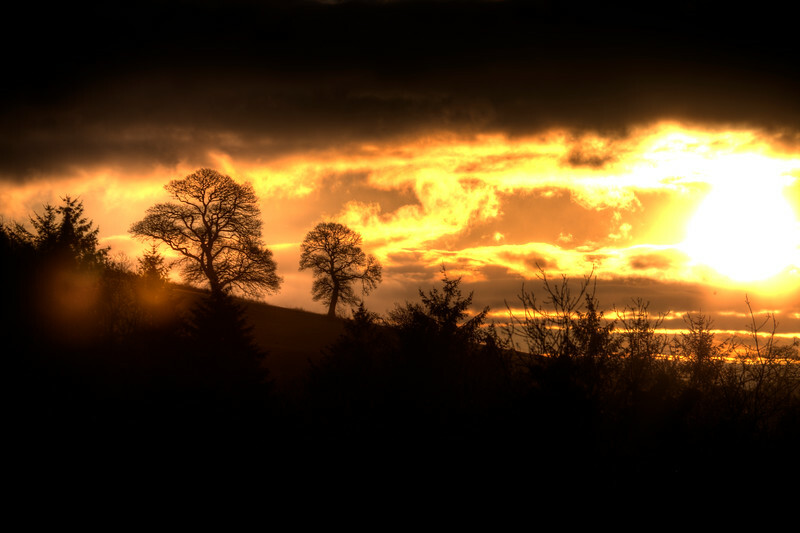 Photographed for our portfolio..... and the client's insurance company! 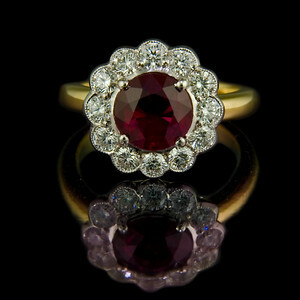 Ruby and diamond engagement ring 2.25ct perfect round ruby surrounded by 0.93cts of brilliant cut diamonds set in platinum with 18ct yellow gold shank. Finished today for a Rumour Jewellery bespoke client. Diamond enagagement ring "Norse" Emerald cut with channel set baguette cut diamonds bespoke engagement ring made by Rumour and photographed for our portfolio. 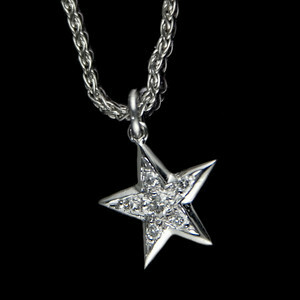 Diamond Star White gold star pendant with pave set diamonds on 18ct gold chain. Photographed for Rumour. 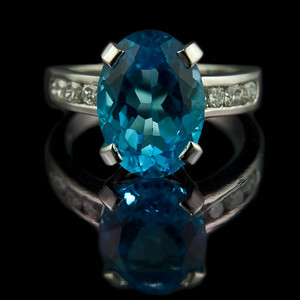 Aquamarine and diamond ring G colour S1 0.50ct brilliant cut diamond with two aquamarines set in platinum. Our use of the scalloped rub-over settings for the side stones works very well to create a smoother look to the overall design. This design seems rather popular at present! 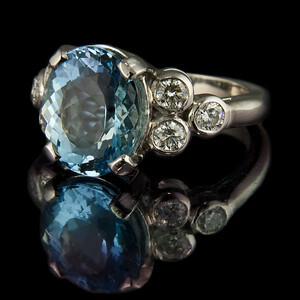 Photographed for our portfolio at Rumour Bespoke Jewellery. 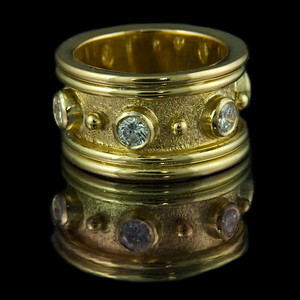 Spin Six Eternity ring design "Spin" Six 0.20ct brilliant cut diamonds with alternate gold beads set in 18ct yellow gold. 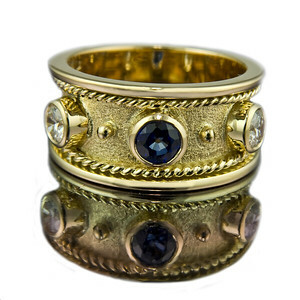 The rough textured inner ring adds great contrast to this impressive ring. Photographed for Rumour. Baguette Eternity Trying out my new reflective trick (with white rather than black). 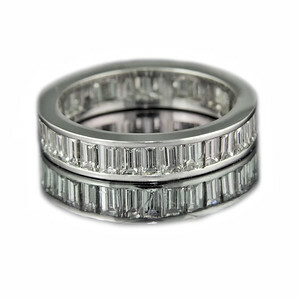 New ring made today... classic eternity ring with baguette cut diamonds all the way around totalling 2.78cts. Photographed for Rumour's bespoke jewellery portfolio and website. 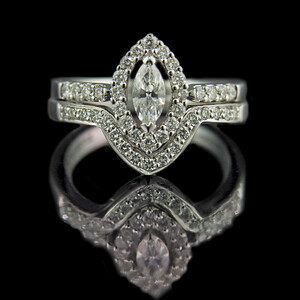 Aquamarine fleur-de-lis engagement ring Oval aquamarine with trefoil set shoulder diamonds set in platinum. 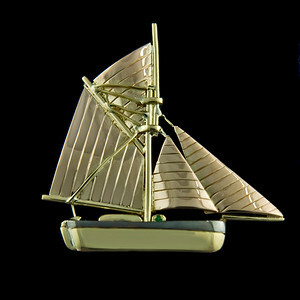 Starting with just an idea about colour, Rumour Jewellery developed the design from the bottom up to be totally original. 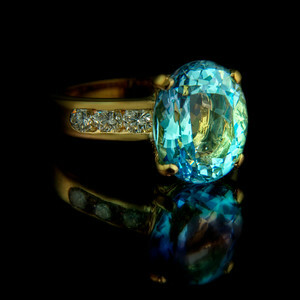 4.65ct oval aquamarine with six 0.10ct brilliant cut diamonds set in 18ct yellow gold. Photographed for the website and portfolio.